Volunteer 2017 Volunteer Program The volunteer program in Clearwater Parks & Recreation started in the early 2000s. The mission of the program is to assist and improve city programs, services, facilities and beautification by recruiting, training and retaining local community volunteers. In other words, they jump in when there is a need to help fill the gaps to provide the best service for the community. In 2017, more than 4,200 Parks & Recreation volunteers donated more than 50,000 hours to the city of Clearwater, for a value of $1,178,000. The department partnered with 85 businesses, neighborhood associations, sports teams, booster clubs, troops and service organizations to ensure the success of special events, tournaments and environmental projects throughout the year. The city’s volunteers are committed to the mission, cheerfully giving of their most valuable asset: their time. People travel from all over Tampa Bay, and sometimes farther, to participate in the city’s volunteer programs. Volunteers do this because they feel valued and appreciated, and they truly make a difference. Recreation volunteers donated more than 25,000 hours to assist with everything from animal care and invasive plant removal to coaching youth and teaching seniors how to use smart phones, tablets and computers. Special event volunteers donated more than 10,000 hours for city events at Coachman Park and recreation centers. They help to make the 15 major events, such as the Sea- Blues Festival and Clearwater Celebrates America event, a success. 64 MyClearwater Athletic volunteers donated nearly 7,000 hours for softball and tennis tournaments as well as swim meets. As Clearwater continues to take a bigger stage in sports tourism, bringing in teams from all over the world to train and compete, volunteers will continue to play critical roles at these events, from team hosts to score keepers. Volunteers assisted with more than 100 environmental projects each year, such as trash cleanup, planting, landscaping and general facility improvements, giving back nearly 6,000 hours. There is a formalized Adopt-A-Park, Street and Trail program within the department, with 25 current adoptions throughout the city. In addition to giving back, being a part of the program is a wonderful way for businesses and civic groups to gain exposure. 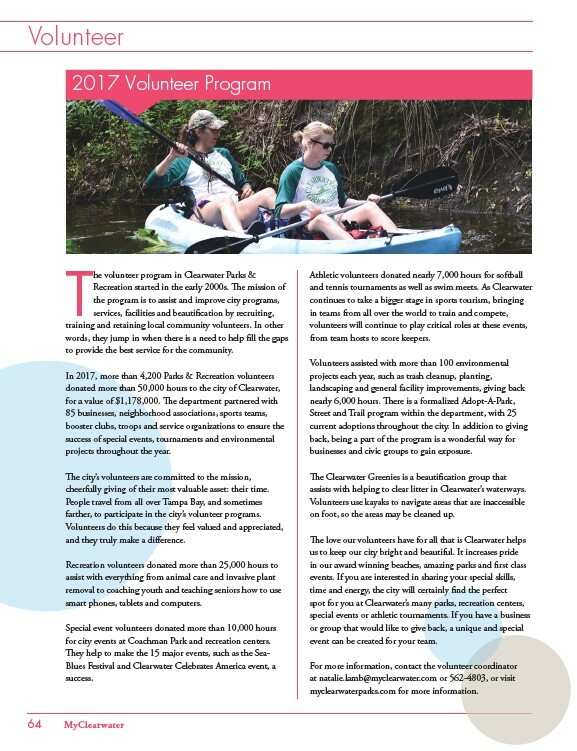 The Clearwater Greenies is a beautification group that assists with helping to clear litter in Clearwater’s waterways. Volunteers use kayaks to navigate areas that are inaccessible on foot, so the areas may be cleaned up. The love our volunteers have for all that is Clearwater helps us to keep our city bright and beautiful. It increases pride in our award winning beaches, amazing parks and first class events. If you are interested in sharing your special skills, time and energy, the city will certainly find the perfect spot for you at Clearwater’s many parks, recreation centers, special events or athletic tournaments. If you have a business or group that would like to give back, a unique and special event can be created for your team. For more information, contact the volunteer coordinator at natalie.lamb@myclearwater.com or 562-4803, or visit myclearwaterparks.com for more information.